Find restaurant and event staff in minutes. From dishwashers to bartenders, and everything else. Staffy can get you help in an instant. Staffy provides you with temporary on-demand staff within 90 minutes, allowing you to hire for restaurants, events, catering, staff augmentation or sick-fills - all with the click of a few buttons. Whether you need staff now or in the near future, we've got you covered, at very economical and reasonable rates! 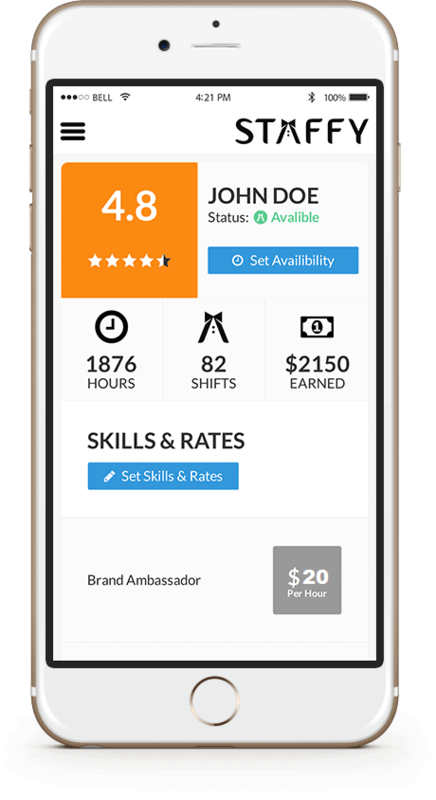 Technology-based platform means staffing your event costs significantly less. Staff can be provided within 90 minutes! With a community-based rating system, all users of the platform will be able to see how staff perform. Hire staff that you want, for when you want! Staffy provides skilled workers in all areas of front-of-house and back-of-house for restaurants, caterers, event companies, and other establishments. To sum it up: Peter was super helpful, the staff were amazing. The servers and bartender(s) were exactly what was needed - courteous, up-beat, hard-working, organized... They were on top of everything, worked amazingly with everyone, managed behind-the-scenes calamities calmly and smoothly - essentially PERFECT. I cannot imagine ever choosing other staffing agency - Staffy is amazing. Fair pricing, and high-end, professional service; I've recommended them to all my friends already! Keep up the amazing work Staffy!!! I have been using their service for the last few weeks. They are reliable and their staff is professional. I highly recommend Staffy. On countless occasions, Staffy has provided us with hard-working staff in last-minute situations. The staff at Staffy respond quickly to calls and always pull through in finding suitable people to fill the necessary roles. Always nice to know we can rely on Staffy to help us out in times of need. Recently started working with Staffy and have been super impressed with their professionalism & responsiveness. As a company that also deals with outsourcing staff for events, we truly understand how complicated the whole process can be. Staffy without a doubt takes the whole stress out of planning and works hard to ensure that any event is a definite crowd pleaser. Staffy's service has been very comprehensive and the staff they provide are very consistent. The prices are fair and we have used them consistently over the past year to fill in gaps in labour for our restaurant. They are filling a need in the market previously ignored by other agencies. Excellent from start to finish. I needed an extra 3 Front of House staff for a wedding my restaurant was catering and staffing. The 3 servers Staffy provided filled in seamlessly with the rest of my staff. Prompt, well groomed, in the dress code I asked for. I can't see any reason to even consider another staffing company. Staffy Staff were reliable, prompt, groomed, courteous and hard-working! We were very happy with Staffy and would use them again in a heart beat! From start to finish, our entire process takes just a few minutes. Register your business, set up a profile, and hire the right person for your needs quickly, so you can get back to regular business operations. And not worry about staffing! Staffy was designed to always be with you - especially when you need it most. It’s available via smartphone, tablet or web. Our real-time integration allows you to go about your regular work-day without missing a beat at any given time, day or night. We work exclusively within the hospitality industry. This includes restaurants, caterers, event spaces and staffing agencies. Similarly, we also work with skilled staffers in the aforementioned types of companies. How it works for staffers!